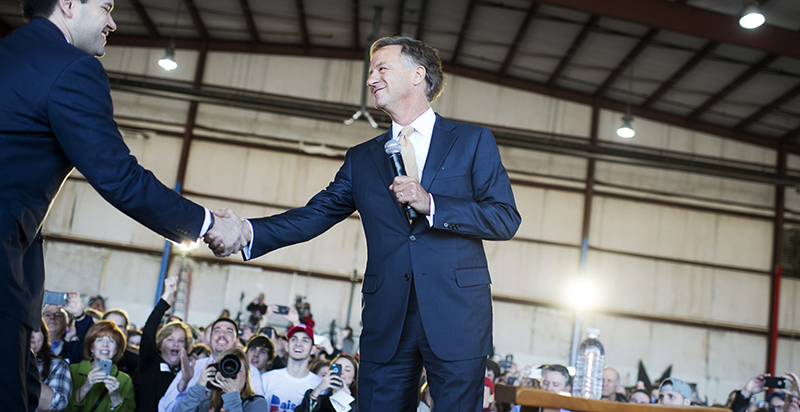 Until Jan. 19 of this year, Bill Haslam had served as governor of Tennessee for eight years. During his two terms, Tennessee students sharply improved their classroom achievement. His state also became the first to offer free community or technical school to high school graduates and adults. And the Republican launched “Drive to 55” to ensure that enough Tennesseans earn a postsecondary degree or credential to match the 55 percent of Tennessee jobs that will require a degree or certificate in the near future. 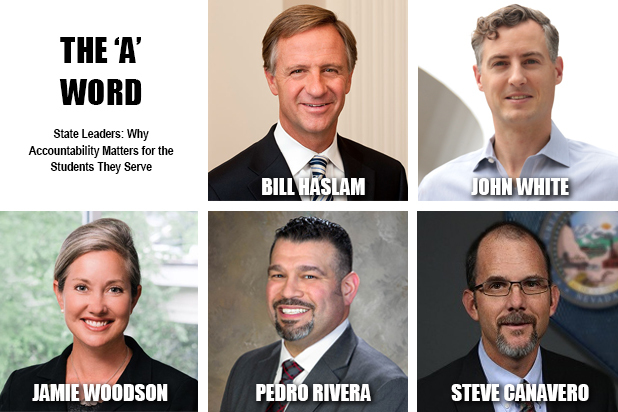 Haslam shares in this ‘A’ Word interview how educating all students means “all” students, no matter their background. The process starts with holding policymakers, educators, parents, and students alike accountable for a successful outcome. The former Knoxville mayor recalls how education wars are as brutal as any public debate, but he reminds the nation’s new governors and their top education advisers that their roles will be as important as any in shaping their state’s future. Before Haslam left office, he spoke with us about modernizing Tennessee’s accountability system so testing data flow faster into classrooms. That way, teachers can have more information to help students master their courses. How do you define education accountability? Has that changed over time? If so, how? Accountability means holding everyone who’s involved — the federal government, state government, teachers, students, parents — for both the investment being made in education and the outcomes for those students. People get caught up in the argument about whether we need to invest more dollars before you talk about accountability or whether we only need accountability and input doesn’t matter. I’m on the side of input and outcomes matter, and we need to be serious about both. How did you apply as governor what you just talked about to various education policies? We’ve been in the middle of that battle over accountability the whole time we’ve been here. Tennessee was one of the big winners in the Race to the Top funding. Our three planks, which our Democratic governor initiated and I am glad our state did, were about raising our standards, having a year-end assessment that matched those standards, and tying the teacher’s evaluation to the student’s progress on those year-end assessments. I think that’s why Tennessee was the fastest-improving state in the last two NAEP [National Assessment of Educational Progress] reports. We did all three of those and tried hard not to back up even as the pushback has grown loud. Tennessee does have a fascinating story over the last decade in particular, but talk about the current situation. Where have we gone wrong in building support for accountability, including for those three planks? I would back up before those planks. First, we went through an extraordinary period in our country. We had a Republican president, George W. Bush, who said that No Child Left Behind means all students. Our version of that in Tennessee is all means all. When we talk about educating all students, it means all students whether they are disabled, low income, or students of color. We believe in their potential. I love it that you had a Republican president focusing on that and saying we are not going to accept that some kids in some zip codes can’t learn. That was a huge step for the country. Then you had a Democrat president go against the Democrats’ biggest voting base, the teachers unions, and tie teacher evaluations to student outcomes. That was a huge step for President [Barack] Obama, and I don’t think he gets enough credit for the political courage to do that. Those two presidents, a Republican and a Democrat, made hard decisions that resulted in the nation focusing on every child. Are we measuring and holding ourselves accountable for what those students learn? That was an extraordinary period, and it paid huge dividends. That said, a lot of people in the education world have a vested interest in things being like they always were. As much progress as we’ve made in Tennessee, a lot of folks would like us to go back. I will say, “You want us to go back to being 45th out of the 50 states?” And they will reply, “Well, no not that.” The way they would have us go would result in us going from being in the low-30s among states to back in the mid-40s. Do you attribute that to general resistance to change, or to something else? Some of that is resistance to change, but an organized effort is working against those things. 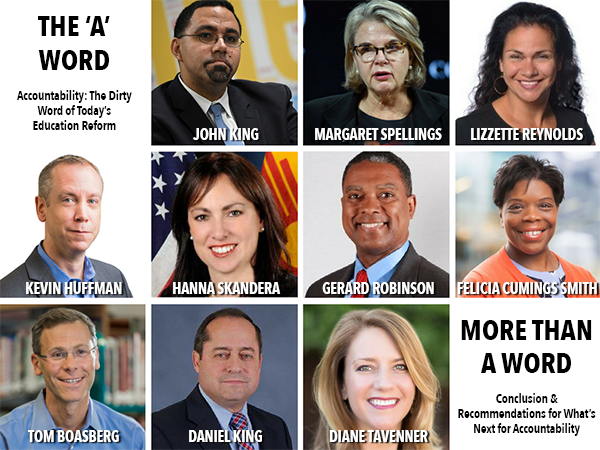 If you talk to anybody who’s been involved in education reform over the last eight years, they would say it went from having the wind at our back to having the wind in our face. Some argue we are adding too much stress on the system and our children by testing, which they say we have to do for this year-end assessment you want. And they say when you tie teacher evaluations to it, now you have overly stressed teachers. You’ve created a situation where learning is not the objective, they say, it’s doing well on the test. That is a good argument on its face. But, in reality, you are saying we don’t think it’s important to measure what students learn. Who suffers the most is our historically underserved populations. One of the beauties of No Child Left Behind and Obama’s efforts was that we started to disaggregate all this data and ask where students are making headway and where they are not. I don’t think forces against reform would say they are OK with historically underserved communities not making progress. But I do think they would say the environment that you created added too much tension into the system and that’s not healthy. Governors frequently focus on workforce development and economic growth. How does your educational system and some of the accountability measures connect to that in Tennessee? Has that ebbed and flowed along with accountability’s ups-and-downs? That’s a great question. This is foundational to why we do what we do. We did a survey five years ago that showed by 2025, 55 percent of the state’s jobs would require a postsecondary degree — whether a two-year or four-year degree or a technical training certificate. We were at 32 percent of the jobs requiring one of those, so we launched an all-out effort to get 55 percent of the population with a degree or certificate. The keys to Drive to 55 were Tennessee Promise and Tennessee Reconnect. They are basically two years of free community college or technical school for everybody. We improved access to postsecondary education. But access isn’t the goal, success is. And we found that a large percentage of our students coming out of our schools needed remedial work in community college. If you need remedial work, there’s a very low chance that you will complete and get a degree or certificate. Our efforts on measuring how well we are doing in K-12 preparation is about more than seeing how well we can do on tests. It is about making sure people are prepared for postsecondary education, which is increasingly necessary for employment. Has Tennessee’s business community been meaningfully engaged in that discussion of late? Nationally and in states, they once were part of the wind at our back you were referencing. What does that look like for you in Tennessee now? The business community is still engaged, and they talk to us all the time about workforce development and the employees they need. Most every conversation that I have with a business in Tennessee today, or one who is looking at coming here, is about whether we have the appropriate workforce. That said, their main business is their main business. It’s hard for them to keep that kind of enthusiasm and political pressure going. Meanwhile, the main thing some folks do is represent the education association and various education communities. And, increasingly, you see a lot of educators running for office. That in itself is a good thing, but we need folks focused on student outcomes as their primary measurement and objective. I’ll add one other point. One of the big changes with the Every Student Succeeds Act is that the federal government has a lot less power than it did before over education. As a conservative, I believe that’s a good thing. It has devolved power down to local school boards and county commissions and state legislatures. But I’m not sure our business community realized the decisions that were being dictated out of Washington are now being decided at their local school board. I’m not certain that we’ve engaged in the right ways with those entities. If the federal government no longer has the same clout, what will it take to get school trustees, superintendents, people at the local level to continue to use data to drive change? My approach is to tie it into the workforce preparation question. Folks have to realize that a lot more of our students need that postsecondary degree or certificate. To do that, they have to be prepared when they leave K-12. To succeed in middle school and high school, they better be reading at grade level by third grade. You have to connect all of the dots for folks to see. Ultimately, what does this child need? What two or three data points do you use regularly? And is there is a data set you wish you could get your hands on, or you wish you could have used? The ones that come to mind are reading proficiency in third grade, because I do think that is foundational. And we do pay attention to the ACT scores of our graduating seniors. It is not a perfect test in that it doesn’t really match the standards we are teaching in our schools. Our year-end assessment, TNReady, does that better. But we need some way to measure ourselves against the rest of the country. The ACT is one way to do that. So I pay attention to third-grade reading, ACT scores, and our own TNReady test to see how well we are doing compared to prior years. Ultimately, it becomes about postsecondary credentials that are achieved. A certain percentage of our students will never achieve those, and we understand that. But we need some measure that shows how our students who are graduating from high school are succeeding when they go beyond that. Could you describe how TNReady is trying to get its testing data back to educators faster? We have struggled with the online portion of that test. “Struggled” is a nice word. We’ve actually had a couple of disasters. Part of that is people wanting to take it with pencil and paper. We can do that, but it takes a lot longer to get those results. The second thing is, the complexity of the test determines how long it will take to get the results back. Our teachers want us to be able to drill down into certain areas to see how well they are doing at teaching a standard. But the more you can drill down, the more complex the test becomes and the longer it takes to return that to the teacher. We think it is important to get it to the teacher quickly. In most cases, teachers want to know how well they’ve done at teaching a standard so they can adjust for the next year. Are you satisfied with getting simple enough information to educators and parents that they can use it to improve achievement? We have the right data. It is more a question of the timeliness of the data so they can use it. I feel very comfortable where our standards are now. And I feel good about our assessment matching the standards. Our issue has been delivering the platform to get the test done and get those results back. A number of new governors are coming in and bringing on state education chiefs. What advice do you have for them? My first piece of advice would be to be bold in who they are looking for as a commissioner. The second would be for the governor and that commissioner to realize this is not a job for sissies. I don’t know any wars that are as brutal as the education wars. And you better be ready to take some arrows in the back and in the front and on the side. That being said, this position can influence the future of the state as much if not more than any other position. Tennessee has plenty of examples of bipartisan education work. Do you have a favorite example of something that works as a result of bipartisanship? Yes, the Democrat governor and Republican Legislature set standards and assessments and evaluations tied to assessment. That led to Race to the Top funding. Also, when all of the unease happened around Common Core, we put together a group of Tennessee educators who came up with high-quality standards. I think they are world-class standards. What holy grail education issues have we as a nation been unwilling to address? The biggest issue is whether we are going to stick to our guns and have that year-end assessment and tie teachers’ evaluation to it. Number two, a year-end assessment that has consequences means you will have a lot of preliminary benchmark tests. Educators will want to see how they are doing midstream. Schools will do more testing than is required by the state. This gets you into the dangerous territory of how much time are we spending testing our kids? We have yet to figure out that battle. But it is critical that we don’t back up on the importance of the year-end assessment. What is at stake for Tennessee and the country to get these education issues right? What is at stake is our national competitiveness. You’ve seen the scores that match how we are doing as a nation. We all think of ourselves as a leading nation for education. The truth is we are no longer setting the standard for educational excellence in the world. That’s a wake-up call. We take great pride in being the fastest-improving state in education, but that still means we are somewhere in the bottom half. We are somewhere in the 25-to-35 range of the 50 states of a country that is falling further and further behind all of the time. What do you think it will take to address some of these systemic problems? To circle back to where we started, we have to still insist on accountability for everyone. It can’t just be accountability for teachers. It has to be students and parents and elected people like me. And we have to remind everybody what is at stake here. This idea that we are preparing our students for their future in the right way, just because we are in America and have this history of leading in education, that just isn’t true.